Fyrinnae is an independent makeup brand that is best known for its loose eye shadows. According to their website, the shadows aren’t colored mica, it isn’t mineral make up (specifically eye shadow) and it isn’t a pigment. What is it? Fantastic!! It’s candy for the eyes. The shades are so complex and have so much depth to them, it makes it hard to describe. Even pictures do not do the shades justice. Another thing that makes this company so great is the amount of product you get for the price. Prices for the eye shadows average $6 and you get 3 grams of product. You can also buy samples for $2.00 and you get ¼ to 1/3 teaspoon of product. Pigmentation is never an issue. In addition to eye shadow, the company also offers blush, finishing powders, highlighter, bronzer, eye shadow primer and foundation primer. The average price for all of their products is $7. I’ve dipped my toe into several of these and have mixed reviews. Pixy Epoxy is their eye shadow primer that is a sticky/tacky gel. It has a doe foot applicator like most glosses. Pixy Epoxy will make these shadows more intense. I typically don’t use Pixy when I’m going to work. It’ll be a little too bright and gleaming, even for Freedom Fridays. I do need it for blog pictures for the intensity. The shadows will work fine with your favorite primer. You can also use these shades wet and get the same intensity, but a sticky base helps with fall out. Pixy is best for the most complex shades but don’t use it for matte shadows. Fyrinnae says it also isn’t designed for shimmer shades with a purple base (don’t know why). My tip for using Pixy Epoxy with pressed shadows is to apply your favorite primer / base and crease / lid shades. Do your blending first! Then apply Pixy (allow time for it to get tacky) and pat on the Fyrinnae shadow. The Pixy will not disturb the pressed shadows already placed on your eye. Blushes/bronzers also come in 3 gram jars (I purchased sample jars). I find this product difficult to use because the jars do not have a sifter and it’s really easy to pick up too much product even if you tapped off. The colors I have are very pigmented and pretty. I didn’t notice any fading though the day. I don’t grab for it too often because I prefer pressed blushes, which are easier to use, especially since I’m typically in a rush in the morning. I’ll have to give it more ‘weekend love’. (Sorry, that sounds weird). The bronzer is also a loose powder. The shade I purchased is way too cool for my warm undertone so I don’t use it. Velvet-Gel Silica Primer is a foundation primer that does not contain silicone. Silicone and other ‘cones’ are the main ingredients in mainstream primers that are really effective at keeping ‘the oilies’ at bay. It’s basically putting a thin film on your skin, but in my opinion will not allow your skin to breath. My acne skin would have a field day with silicone. So, I couldn’t wait to try this product. Unfortunately, it doesn’t work…for me. I’ve heard my people on makeup forums where this gel is a Holy Grail product. I still use it occasionally. Finishing Powder-Oil Control is a fine translucent powder that is supposed to set your makeup and control oil. I made the costly mistake of buying Makeup Forever HD Microfinish Powder for $30! Imagine my surprise and anger (at MUFE) when I find out that Fyrinnae offers the same product for a fraction of the cost and more product! 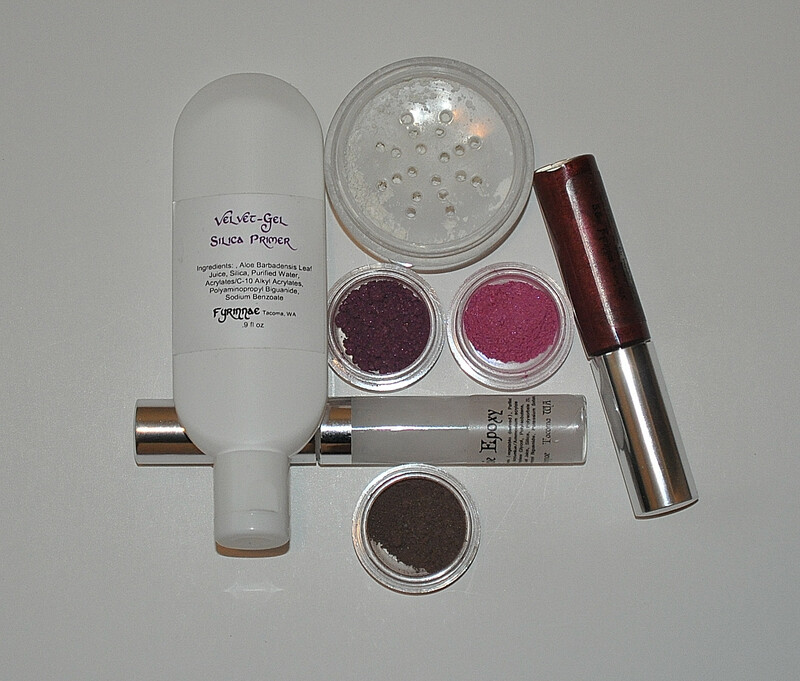 (Fyrinnae Oil Control powder is mica and kaolin and MUFE is silica, but Fyrinnae also offers 100% silica powder too.) I’ll admit; I never used these powders as a finishing powder because it isn’t as translucent as companies claim. If you have some color to your skin…you won’t after applying silica powder. That is nothing against Fyrinnae at all. It’s the nature of these powders. I like using this powder before applying my powder foundation to try and fight ‘the oilies’. I’ve found this in combination with the Silica Gel works better, but oily skin is just a beast (I’ll refrain from using the other ‘B’ word). Loose Eye Shadows come in various finishes and types; color changing, high shimmer, low shimmer and matte. Fyrinnae’s website has really good swatches and descriptions of their shadows. I have found some shades appear slightly different on me because of my skin tone and undertone. As stated before, these shades are complex. Even the matte shades aren’t just plain flat colors. Some shades are easy to work with, some are tricky and some are easy to ruin during application. As with all loose shadows and pigments, you need a good, flat compact brush. If your shader brush has the slightest amount of fluff to it, expect fall out. The matte shades are easier to use with a fluffy brush, but start with a light hand and build up the color. As seen in many You Tube videos: I always pick the color up from the jar with my brush and tap it on the lid. I’ll then press down on the color with my brush and then apply to the eye lid. The most important tip is pat on the color. Start the patting where you want the most intensity and pat away to blend out. The second you start a sweeping motion with a shimmer shade, you’ll ruin the color. Some shades have a black base or dark base or matte purple base. If you don’t pat, you’ll sweep away the prettiness and only the base will end up on your eye (the prettiness will land on your cheek). Shades with a dark base almost always need the Pixy Epoxy to make application easier. If I’m working with a color that has a dark base (Pixy or no Pixy), I don’t press down too hard on the color while it’s in the lid. That will sometimes ruin it too because the base shade will end up on the brush and prettiness will be left in the lid. Don’t give up and don’t let that deter you. Not all shades are this hard or tricky to use. It may appear as if I’ve purchased every shade, but I haven’t. I don’t own many shades with a dark base. The shade descriptions in italics are taken from Fyrinnae’s website. I’ve added my own two cents if my eyes see something different in the shades. I’ve noted shades that have been discontinued. If you don’t see a particular shade in this post on the website, it may be out-of-stock or being reformulated. Array of colors and neutral shades. It takes a bit of time fulfill orders. The average time for me is about a week and a half. No sifter for the jars for the shadows. Be careful if you’re accident-prone. Some shades can be a challenge to work with.